This topic describes how Cloud Foundry (CF) administrators can set feature flags using the Cloud Foundry Command Line Interface (cf CLI) to enable or disable the features available to users. To perform the following procedures, you must be logged in to your deployment as an administrator using the cf CLI. For descriptions of the features enabled by each feature flag, see the Feature Flags section below. Only administrators can set feature flags. All flags are enabled by default except user_org_creation and diego_docker. When disabled, these features are only available to administrators. user_org_creation: Any user can create an organization. If enabled, this flag activates the Create a New Org link in the dropdown menu of the left navigation menu in Apps Manager. Minimum CC API version: 2.12.
private_domain_creation: An Org Manager can create private domains for that organization. Minimum CC API version: 2.12.
app_bits_upload: Space Developers can upload app bits. Minimum CC API version: 2.12.
app_scaling: Space Developers can perform scaling operations (i.e. change memory, disk, or instances). Minimum CC API version: 2.12.
route_creation: Space Developers can create routes in a space. Minimum CC API version: 2.12.
service_instance_creation: Space Developers can create service instances in a space. 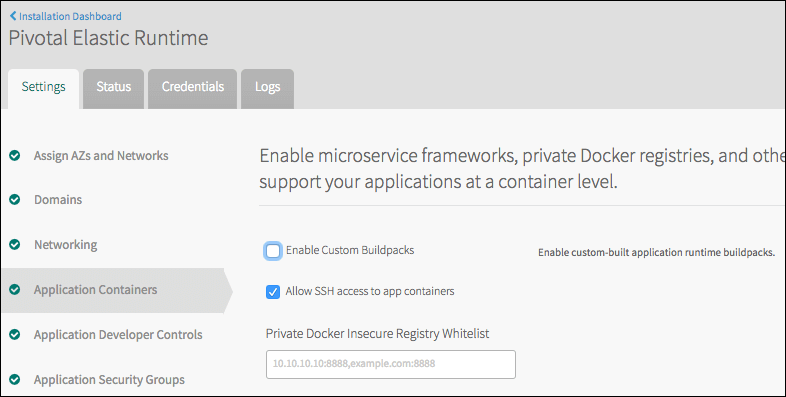 Minimum CC API version: 2.12.
diego_docker: Space Developers can push Docker apps. Minimum CC API version 2.33.
set_roles_by_username: Org Managers and Space Managers can add roles by username. Minimum CC API version: 2.37.
unset_roles_by_username: Org Managers and Space Managers can remove roles by username. Minimum CC API version: 2.37.
task_creation: Space Developers can create tasks on their application. Minimum CC API version: 2.47.
env_var_visibility: All users can view environment variables. Minimum CC API version: 2.58.
space_scoped_private_broker_creation: Space Developers can create space-scoped private service brokers. Minimum CC API version: 2.58.
space_developer_env_var_visibility: Space Developers can view their v2 environment variables. Org Managers and Space Managers can view their v3 environment variables. Minimum CC API version: 2.58.
service_instance_sharing: Space Developers can share service instances between two spaces (across orgs) in which they have the Space Developer role. hide_marketplace_from_unauthenticated_users: Do not allow unauthenticated users to see the service offerings available in the marketplace. For more information about feature flag commands, see the Feature Flags section of the Cloud Foundry API documentation. You can disable custom buildpacks using your Ops Manager PAS tile. From the Cloud Controller tab, check the Disable Custom Buildpacks checkbox, as shown in the image below. By default, the cf CLI gives developers the option of using a custom buildpack when they deploy apps to PAS. To do so, they use the -b option to provide a custom buildpack URL with the cf push command. The Disable Custom Buildpacks checkbox prevents the -b option from being used with external buildpack URLs. For more information about custom buildpacks, refer to the buildpacks section of the PCF documentation.